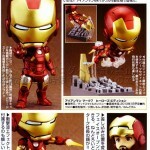 The November issue of Hobby Japan has shown new images of the Nendoroid Iron Man Mark VII in color! The prototype of this figure was shown early last month. Speaking of Iron Man, the Avengers movie will be released tomorrow on Blu-ray and DVD! The SD Mark VII figure includes a display stand, effect parts and an opening faceplate. Thanks to Cybergundam Blog for the scan which you can check out by clicking the thumbnail! Revoltech meets cosbaby. I like the repulsar effects and base, if cheap enough I'd buy it, but doesn't look cheap lol. I'm thinking $30+shipping at best. ^ I bet it is closer to $50. 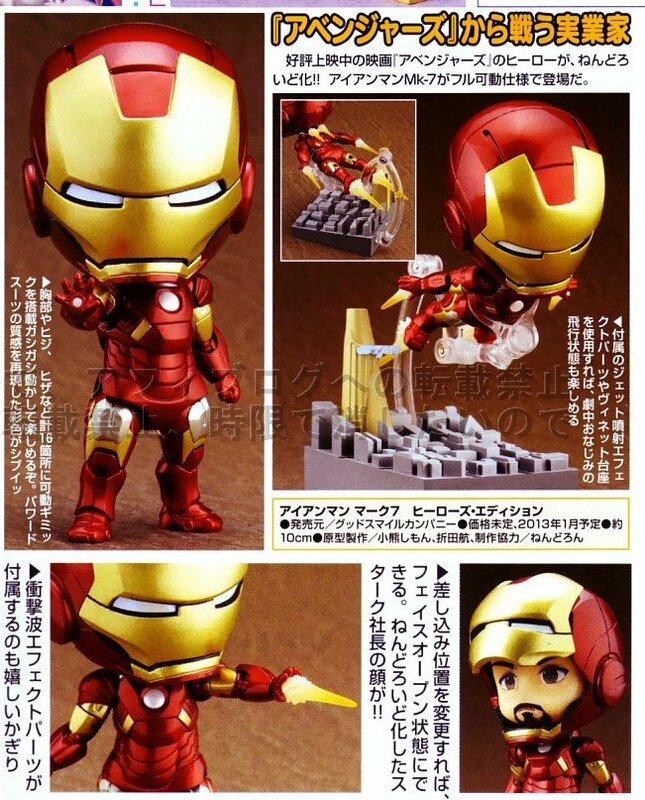 Wasn't expecting that alternate Tony Stark Nendo head though; that is cool as heck. I love Nendos... I only have 1 regular Nendo, but I have several mini-Nendos. I hope they make a Nendo petite version of IM too. this is a must buy I hope will see warmachine next!! !